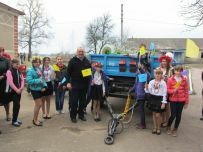 On 6-7 April 2016, there were two official openings of the agricultural cooperatives – “Dobrobut Shevchenkove-2015” in Shevchenkove village and “Polisyanochka” in Pervomaiske village – taking place in Sumy region. These cooperatives have been created with support of the joint UNDP/EU project “Community-based approach to local development” (CBA). Both events marked a special day for the villagers of Hlukhiv rayon and the neighboring rayons. The invited guests congratulated the cooperatives with successful completion of the microprojects and said that their participation in the CBA project means a big responsibility for the whole community of Hlukhiv rayon. Therefore, it is necessary to show good results of cooperation with the CBA and introducing European standards. Members of cooperative told about their experience, the long path that led them to success, as well as showed their agricultural machinery and equipment. The guests from Berezivska community wished them every success and said that these cooperatives will serve as successful example for them.